Establish a budget. 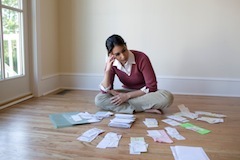 The first step is for evaluating your expenses to see where your money goes. List your daily expenses, such as transportation and food, and your recurring monthly expenses such as rent or mortgage, utilities, and credit card or other debts. Once you know where you are spending money, you can more easily determine options for cutting costs and saving more. Have a debt repayment plan. If you have debt, your goal should be to pay it off as quickly as possible. Focus first on the debts with the highest interest rates, to minimize your monthly interest charges by paying off the debts first. Build an emergency reserve fund to help you pay for life’s unexpected expenses. Even if you have insurance, don’t expect it to pay for a new hot water heater if yours unexpectedly dies. An emergency reserve helps you pay for unexpected costs that may arise. Consider opening a bank money market fund to be used only as an emergency fund. Start saving for retirement. The sooner that you are able to start saving, the better. Participate in your company’s 401K plan if possible. Don’t think of saving for retirement as taking money out of your paycheck, but rather as automatic payments toward your future. At the very least, you should aim to contribute enough to your 401K to get the full benefit of your employer match. This is free money that you shouldn’t leave on the table. Consider taking out a life insurance policy if you have children or other dependents. Life insurance premiums typically are lower when you are young and healthy. For most policies, the monthly premium cost will never increase for as long as you own the policy – so purchasing now may actually be cheaper than waiting until later to do so. As you age, your health may change and prevent you from finding an affordable coverage option or a policy. Speak to an insurance professional about the benefits of purchasing a life insurance policy. Start putting money aside for your children’s college education. If you have the means to do so, consider setting up a college fund for your children. In some cases, you can decide how much to set aside each month and how much money you want to have when it’s time for your children to enter college. Click here for information about the Gerber Life College Plan, which also includes an adult life insurance policy for you.